With the generosity and good humor that guide all her endeavors, Mma Ramotswe will untangle these questions for herself and for her loved ones, ultimately bringing to light important truths about friendship and family – both the one you’re born with and the one you choose. I have quite a few authors that are “must read” authors. Meaning I must read any book that they write. I guess Alexander McCall Smith is not quite that. I read every one of his No. 1 Ladies Detective Agency books though. I love these books! The author has done such a great job with the characters, the plots, and the setting. I always feel like I’ve been to Africa after I’ve read one. I do have to admit that I have no idea how to say the characters names or the place names. Precious Ramotswe is the main character in all of these. She’s a traditional built lady (I love how she’s sometimes called other things, but never takes offence) and she runs the detective agency. The reader sees the whole plot through her eyes. She’s just a fun character. I love the way she always knows how to solve whatever mystery has been brought to her. She makes everything better. One thing I really liked about her in this book is the way she felt human. Something happened in her personal life that kind of threw her for a loop. She was not happy for a little bit, something very uncharacteristic of her, but she was able to forgive and move on. I loved that! The plot of this one is great! These books are not fast moving, there’s usually no danger. But there is always a problem and you always learn a little bit more about Africa and about people. And since Precious is a traditional lady, the books are all clean. I love these, I can’t wait for the next No 1 Ladies’ Detective Agency book! 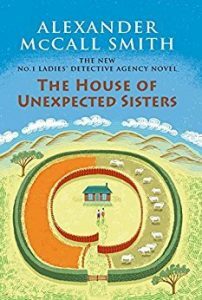 I borrowed The House of Unexpected Sisters from my local library.